A Christmas photo from 7.5 years ago that I've just got around to scrap! I typically only do Christmas photos around Christmas time (I think?? I don't scrap many of them!) - because I'm in the festive mood I guess. And Christmas supplies are more readily available, if you're not just using from your existing stash. This layout was made using materials from my stash: a few left over bits from Christmas collections from last year, as well as older - much older - bits and pieces from old Christmas cards, printed digital files, and punched patterned paper hearts from a Christmas collection from many years ago. I really do love using old supplies. Whether on their own or mixed with newer, on trend, collections. And I also enjoy things not designed to be used on a layout (or card) - in this case cutting apart Christmas cards I really liked (the Christmas tree on the left and the dove on the lower right). 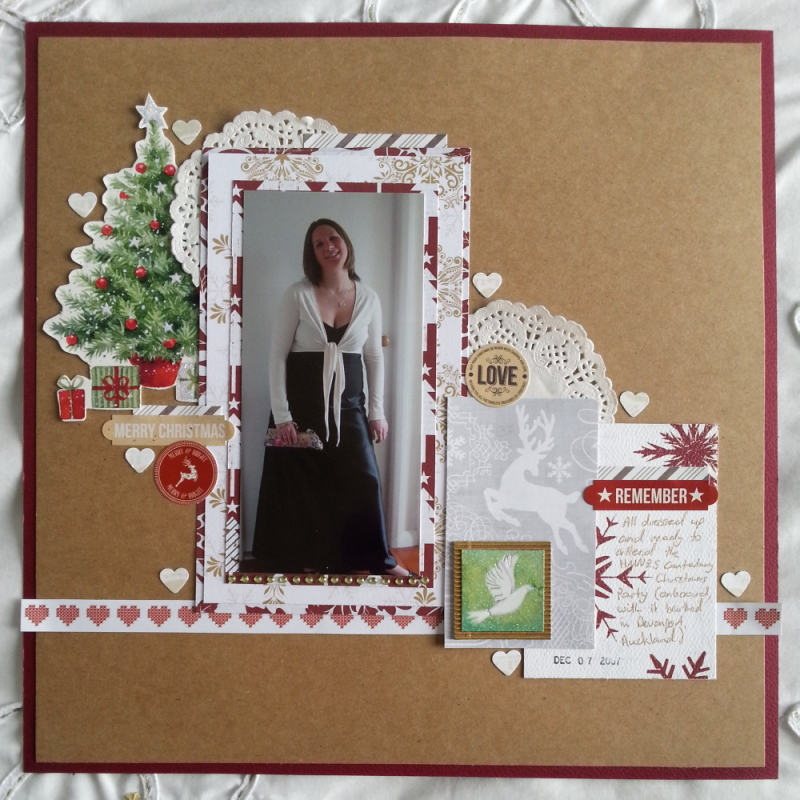 In this case the glittered Christmas card pieces added glamour to my layout. And lots of layers added to the elegant style too. This layout will be entered in the Artfull Crafts June and July Challenge (Anything Goes). Go pull out some old favourites from your stash and make something! The Bright and Cheery Kaisercraft "Say Aloha"